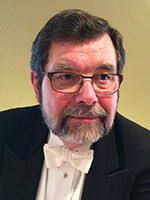 Dennis L. Johnson is presently Director of Bands and Orchestra and Associate Professor of Music at Murray State University in Murray, Kentucky. At Murray State he conducts the Chamber Winds, Symphonic Wind Ensemble, the University Symphony Orchestra and the pit orchestra for the opera and musicals. Bands and Ensembles (WASBE) and as the Artistic Director for the World Projects Wind Band Festival in Washington, DC. He has served as Kentucky State Chairman for the College Band Directors National Association (CBDNA) and state collegiate representative for the Kentucky Music Educator’s Association (KMEA). Under Mr. Johnson’s leadership the Murray State University Wind Ensemble has made several prestigious appearances including two special invitational concerts in Carnegie Hall; two appearances at the College Band Directors National Association Conventions, at the International Wind Band Conference in Manchester, England, the Kentucky Music Educators Association (KMEA) conventions and this past Spring in the great hall at the Kennedy Center in Washington, D.C. In the Spring of 2011, his Symphony Orchestra presented a special invitational concert at Orchestra Hall in Chicago, IL. Upon completion of his undergraduate studies at The University of Michigan, Mr. Johnson spent seven years as Director of Bands in the public school systems of Boyne City and Traverse City, Michigan. In 1975 he was appointed Director of Bands and Personnel Coordinator for The Interlochen Center for the Arts. His development of the wind band program at the Arts Academy earned him high praise. Following four very successful years at Interlochen Mr. Johnson enrolled as the first D.M.A. Candidate in Instrumental Conducting at Michigan State University. Upon completion of the first year of the program, Mr. Johnson was offered the Director of Wind Ensembles position at Western Illinois University – a post he held for five years. He was appointed to his present position in 1985. In 1998, Phi Beta Mu honored Mr. Johnson as its “Outstanding Contributor to Bands”. In 2002 he was inducted into the prestigious American Bandmasters Association (ABA). In the spring of 2003 he guest conducted the China Youth Corps Band in Taiwan. In the summer of 2003 he directed the youth honor band at the Mid-Europe conference in Schladming, Austria. In the Summer of 2004, Mr. Johnson served as the “Chairman of the Executive” for the “World Cup for Bands” which had its first festival that year in Vienna, Austria and its second conference in 2006 at the Eastman School of Music in Rochester, New York. In September of 2004 Mr. Johnson guest conducted the Central Air Force Band of Japan in Tokyo and the Australian Youth Honors Wind Band of Brisbane, Australia. In the summers of 2006 and 2008 Professor Johnson served on the jury for the “Coups de Vents” wind band composition contest in Lille, France. In 2008 he was a clinician/adjudicator for the World Projects Band and Orchestra Festival in Sydney, Australia as well as the inaugural SIBF International Wind Band Festival in Singapore. In constant demand throughout his career as a guest conductor, clinician and adjudicator, Mr. Johnson has appeared in Argentina, Australia, Austria, Canada China, Colombia, England, Israel, Italy, France, Germany, Hungary, Hong Kong, Korea, The Netherlands, Singapore, Spain, Switzerland, Taiwan, and in most states throughout the U.S. He is presently listed in the prestigious Marquis’ “Who’s Who”, the Cambridge “Dictionary of International Biography” and the “Global – Who’s Who”.